Overflowing with hop flavors of strawberry, coconut, roses, Tutt-Fruitti jelly beans, guava, tangerine, and passionfruit. 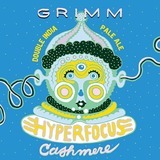 Hyperfocus Cashmere is the fourth in our series of single hop double IPA’s. It highlights Cashmere, a new hop that is blowing us away. Overflowing with hop flavors of strawberry, coconut, roses, Tutti-Fruiti jelly beans, guava, tangerine, and passionfruit.